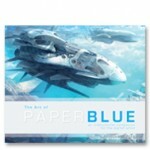 Art of the PaperBlue is a must have art book for artists, entertainment designers, and anyone who wants to learn to paint creative environment paintings. PaperBlue shares his knowledge of creating environment conceptual paintings for movies, games, and other entertainment industry fields. This book shows more than 10 full-length step-by-step tutorials with detailed explanations and hundreds of stunning art works and numerous quick sketches. In addition, PaperBlue shares his techniques of using custom brushes, smudge tools, color theories, compositions, and many other techniques helpful in creating imaginative art works. This book features Sci-Fi environment paintings, fantasy paintings, vehicle designs, Mechs, ships, fighters, aircrafts and more. Get ready to be inspired by the gorgeous artwork of PaperBlue, all while learning his painting techniques via step-by-step tutorials. Categories: Books, educational. Tag: Jae-chul Park.